Catwoman: Soul Stealer (DC icons #3) by Sarah J. Maas is a 2018 Random House publication. I’ve seen this author’s name on Goodreads a lot and apparently her fantasy series is really something. 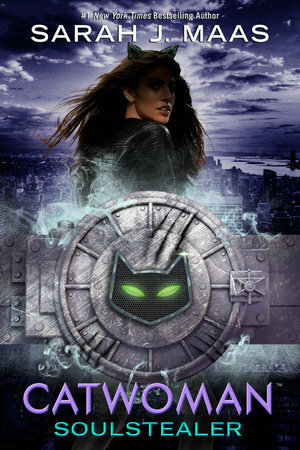 I do hope to someday visit that series, even though I’m not a huge YA fan, but the reason I chose this book had little to do with the author, and more to do with subject – Catwoman. In fact, when I checked the book out at the library, I didn’t even check to see who wrote the book- nor did I notice ‘for young readers’ tag line. But, as some of you know, I recently developed an interest in comics and graphic novels, but there are so many stories surrounding the iconic DC comic characters it is hard to know here to begin. But, this series, which at the time of this writing, as four installments- Batman, Superman, Wonder Woman and Catwoman, tells a story about the origins of these iconic DC comic characters. This series is, for young readers, I presume, but I thought it was pretty awesome. To be clear, this is not a graphic novel. It is a text only story, but I read it to gather more insight into the characters featured in the comics. I was always intrigued by Catwoman. She isn’t a goody-goody, but she isn’t evil either. Of course, since the campy television series, Catwoman has been highly sexualized, outfitted in a skin- tight leather outfit. However, this book really downplays that angle-thank goodness, and gives us a complex character and offers a valid reason for her chosen path. That alone scores a few automatic points. Her partners in crime are also interesting, adding even more angles to explore. However, I wasn’t familiar with Batwing, so this book was my first introduction to him. Instead of being a temptation to Batman, as I am most accustomed, Selena Kyle- aka- Catwoman, enthralls Batwing, who is supposed to be keeping Gotham City safe while Batman is away. They have the same dynamic really, forcing Batwing to soften his stance and concede to extenuating circumstances, setting up an intriguing and conflicting relationship between the two characters. In my opinion, this author did a good job with this book. Although it is an easy read, it is very imaginative, with some darker tones, and I believe there’s a little grit in here, too. This book was very cool, I thought, although I see the ratings on this one varies, wildly. But, at the end of the day, whatever the criticisms might be- I didn’t read them- I liked it. So, I think I’ll hunt down the other books in the ‘DC icon’ series, too.